Anyway, here’s the link to the interview. There are two MP3s on that page for some reason; they’re both the same interview. I intend to make that available from this website in case that link goes away. I’ll post the link when I do. Meanwhile, work on the next two Kakuloa books and the sequel to The Eridani Convergence continues. Look for releases beginning in May. Finally. It still needs a few finishing touches based on early-reader feedback, and the usual publishing steps like formatting for print and ebook, cover blurbs, and so on, but the story is done. A Rising Tide comes in at about 85,000 words, so my longest yet. The book starts out following the Victoria to the planet Kakuloa (in the Alpha Centauri system) immediately after the events of The Return, then skips forward a few years to the settlement of Kakuloa, and the rise of the squidberry* industry…and the problems they’re having with tree squids. Cephalopod expert Dr. Ellie Greystone is called in, but she has problems of her own on Earth, and not everyone on Kakuloa is happy with what she’s discovering about the squids. Squidberries aren’t the only industry on Kakuloa, of course. It’s becoming a jumping-off spot for further interstellar exploration; a resort developer likes the beaches, and especially likes some loopholes in the law governing the planet; and William Blake finds his role expanding from mission commander to de facto planetary administrator, with all the associated headaches. There will be more books in the Kakuloa series, bridging the gap between Alpha Centauri and the The Chara Talisman, but without the cliff-hangers that the Alpha Centauri series had. Jason Curtis will show up in there somewhere. 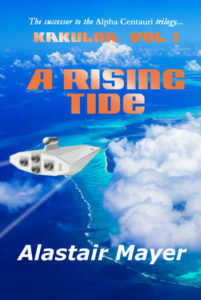 A Rising Tide should be available around Christmas. That’s the cover above on the right. Now, I have a couple of others to finish…. UPDATE: Kakuloa: A Rising Tide is now available in both Kindle and trade paperback editions. It is also available on Kindle Unlimited. I keep promising that the next book is coming Real Soon Now, and it is, so I though folks might be interested in just how it is progressing. I keep track of my writing time and word count in a spreadsheet (this is valuable, especially if you’re doing something on a deadline like NaNoWriMo). Below is a chart from the current spreadsheet. The dates along the bottom should be self-explanatory. The horizontal lines mark increments of 10,000 words. 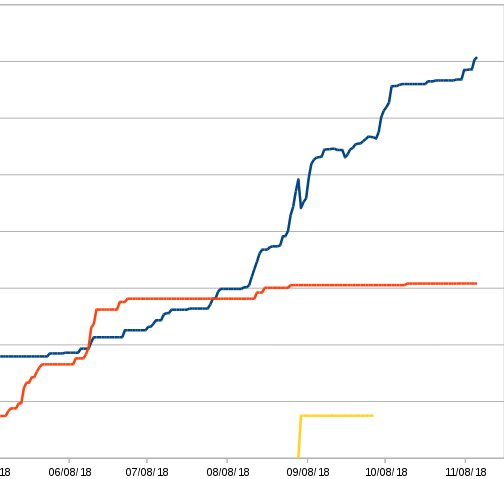 The dark blue line, which just crossed the 70,000 mark, is for Kakuloa: A Rising Tide. The orange line is for The Pavonis Insurgence. You’ll notice a sharp dip in the blue line just before 09/08/18. That’s when I realized that a couple of chapters I’d already written more properly belonged in a later book, so I took them out. That’s the yellow line (incomplete because I’m not tracking it at the moment), which will be Kakuloa: A Downward Slide when it’s done. The wavery bits in the September/October time-frame are where I’m doing some editing and revising, and October looks relatively flat because I’ve been removing outline notes to myself (which I embed in the text as I go along) and replacing them with actual story. Also incorporating edit fixes from my alpha readers. (Also dealing with some non-writing crap, like replacing my car.) Pavonis is mostly horizontal recently because I’m focused on finishing Kakuloa; it will climb rapidly once that one is done. My pace this year has been slower than last, partly because of life interfering, but also because I’m having to do more extensive research and world-building (and keeping track of it all) than for the first Alpha Centauri trilogy. Next year should go faster. So. I’m not forecasting a release date yet (still aiming for this year though), but my editor/beta readers should have it by Thanksgiving. For which I, for one, will be truly thankful. P.S. There’s another chapter I pulled out because it was more of a sidebar that just didn’t fit. It’s relevant background, though, so I’ll probably make it available to my newsletter subscribers. You can go here to sign up. No spam, I promise. Today is Veterans Day in the US, Remembrance Day in Canada and the UK, and is also marked in other countries under different names. To all those who served: thank you. All books are signed, but I will be happy to personalize them from 2pm to 4pm on Nov 2, 11am to 1pm on the 3rd, and 2pm to 5pm on the 4th. Look for the T-Space poster. Things have been a little crazy over the summer. Too much going on and not enough progress on the next books. As mentioned earlier, I had The Eridani Convergence re-edited and republished (see the earlier post below). I am planning on doing second editions of all the previous novels, with some updates and additional material, but that will wait until at least Kakuloa is out. 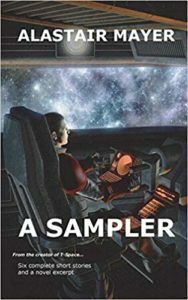 I pulled my old collection Starfire & Snowball (with the crummy cover) and issued a new collection (with many, but not all, of the same stories), Alastair Mayer – A Sampler. 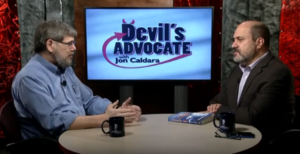 (Cover image at right. Much better than S&S.) This is currently paperback only, but there will be an e-book version shortly. This will be available on most e-book outlets, currently the novels are Amazon only (it’s a restriction imposed by Amazon to be available through Kindle Unlimited). Stay tuned (or sign up for my newsletter) for news about getting a free copy of this. Conventions I’ve already done StarFest and Westercon this year, next up (August 24-26) is Bubonicon in Albuquerque, NM. Alas, I missed WorldCon and I think I’m going to have to give DragonCon a miss too because of work schedule. 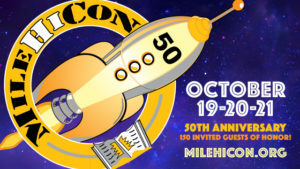 MileHiCon 50 (October) for sure, and I’m debating World Fantasy Con in November. Works In Progress Kakuloa is coming along slowly but steadily. It’s a sequel to the Alpha Centauri trilogy, but not exactly the fourth volume. It starts just after The Return leaves off, but then skips forwards a few years to when the planet is being settled by squidberry farmers and Kakuloa City is being built. A few characters from the trilogy make appearances, but it is mostly new characters and new plots, and the book covers a span of a few decades (Jason Curtis puts in an appearance). The next Carson & Roberts book, The Pavonis Insurgence, is about one-third done. This one feels like the middle of a chess game; it’s a matter of getting all the pieces in the right places before the end game, which will be the next series of books, where we’ll see a lot more of various spacegoing aliens. As background to all this, I’ve been worldbuilding. Some of that shows up on the T-Space Wiki, although I try to avoid too many spoilers for work that isn’t published yet. Check it out, and if you want edit access, just ask. 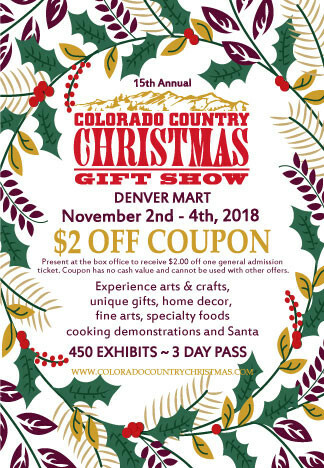 I’d love to have some help with it.